Imagine you’re out for a day of enjoyment, either to do some shopping or dine at a restaurant, and you step on a slick substance, lose your footing and come crashing down on the hard floor. Your pleasant day takes a painful detour to the emergency room, and you have a long road to recovery ahead. At Lampert & Walsh, LLC, our personal injury attorneys provide aggressive representation in slip-and-fall cases. For more than 35 years, we have fought for our clients’ rights, all the way through trial when necessary. We have the experience it takes to assemble sufficient evidence to win these complex cases. A hazard existed — Examples of unsafe conditions include wet or icy floors, broken and uneven surfaces, potholes, dark passages and areas strewn with debris. The hazard was not obvious — If a visitor can see that a hazard exists and approaches, it’s possible the court would find that the visitor assumed the risk of a known hazard. A posted warning that points out the hazard may be sufficient to shield the landowner from liability. The owner should have known the hazard existed — Landowners who open their grounds to the public or to private guests must take reasonable steps to inspect the area. The owner was unreasonable in failing to remove the hazard —The injured plaintiff must prove that the landlord was negligent in allowing the hazard to remain in place. All of these points are debatable, which is why you need an experienced personal injury attorney to investigate, assemble evidence, and make a compelling case for your recovery. What is reasonable in a premises liability case? Proving fault in a slip-and-fall or trip-and-fall case hinges on showing that one of the parties was unreasonable. Was it the landowner for failing to discover and remove the hazard? Or was the injured guest unreasonable in failing to notice a possible hazard and take appropriate care? In many cases, timing becomes a major issue. Did the landlord have a reasonable amount of time to discover the hazard and react to it? In the classic example of a spill in a supermarket, the owner may not be liable if there simply wasn’t enough time to post a warning or clean up the mess one customer made before a second customer fell. You should also be aware that as your attorney is trying to show that the landlord was unreasonable, the landlord’s attorney is arguing that you fell because of your own carelessness. Under Colorado’s modified comparative negligence law, if you bear as much as 50 percent of the blame for your fall, you can’t collect any compensation from the landowner. This is another reason you need a determined attorney fighting on your side. If you’ve sustained a serious injury in a slip-and-fall accident, have a premises liability attorney at Lampert & Walsh, LLC evaluate your claim for free. We work on a contingency fee basis, so you don’t have to worry about hourly billing or a high retainer. You don’t pay any legal fees unless we obtain a settlement or jury verdict for you. 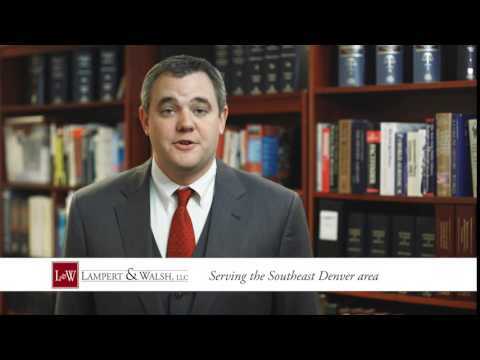 To get the compensation you deserve, call us today or contact our Denver office online.